Let’s face it, some trends and product launches can be flops – we’re looking at you, Google Glass and Cheetos® Flavored Lip Balm. But, while many organizations may be reluctant to get behind the latest socially-conscious trend – such as ditching plastic straws for reusable ones – it’s clear this shift is here to stay. Equally important is that your business gets on board. Not only is it the right thing to do but, but showing your customers you care, will drive more engagement, more consideration and more conversion from buyers who care, to buyers who will become your ultimate long-term customers and advocates. Believe it or not, Americans are using and tossing about 390 to 500 million straws per day. And, despite our most well-meaning efforts, those straws are ending up in not-so-great places – think landfills (where they take 200 years to decompose), water supplies (gross) and oceans (sorry, sea life). What’s more, because many of these straws are made from polypropylene – not far off from what powers cars – dumping these straws increases greenhouse gases and drives climate change in the wrong direction. So, while it may feel like nothing to toss a plastic straw or two, they do add up fast. And as they do, their impact is felt, literally, for generations. Sip on that! Send your team out with a socially-conscious product, one that is on the tip of your clients’ collective tongue and you’re giving them a serious leg-up. Think about it – hand over a perfectly-package reusable straw with a quick, personalized note and nod to why you chose this forward-thinking piece and you’ve got their attention. More importantly, you’re giving that client an opportunity to show off their trendsetting, eco-friendly side, without the heavy lifting. It’s truly a win/win and, really, who doesn’t love that? Think about how many times you sip through a straw in a single day. A lot, right? There’s the iced coffee en route to the office; the sparkling H2O you’re sipping desk-side; and the straw popped into your meal time drink order. The list goes on and on, and each straw is, believe it or not, super toxic. It’s simple – you want to be the brand that does its part and sets the trends for your team, your clients and beyond. Enter reusable drinking straws. The majority of Americans haven’t yet converted from classic plastic but, given the media buzz, most have heard about the push for a change. In other words, you’ve got a primed market out there, jam packed with people who know there’s an issue but maybe aren’t fully in the loop, or simply, haven’t gotten their hands on a reusable straw just yet. Our advice? Be the solution and you’ll forge a serious bond personally and professionally – and, of course, you’ll be laying the groundwork to share your branded straw over a quick drink (or two…). 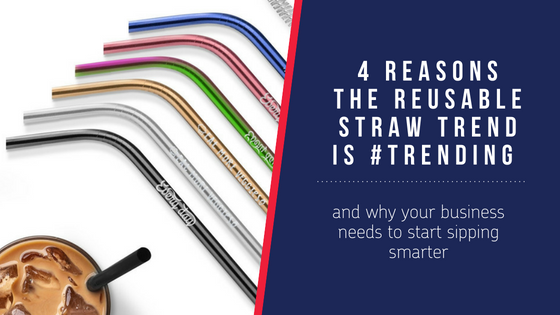 Check out our new collection of reusable straws and set the wheels in motion for your next great promo piece.